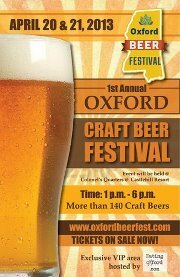 We are mere days away from the Oxford Craft Beer Festival, which will take place from 1:00 p.m. to 6:00 p.m. Saturday, April 20, and Sunday, April 21, at Colonel’s Quarters at Castle Hill. I have a special interest in the event since I’m organizing the VIP area, which involves six Oxford chefs being teamed up with craft brewers to create unique dishes that either integrate or pair with craft beers. All VIP ticket holders have access to the general admission area as well, and will have access to special brews, complimentary food and water/soda, and entrance into the festival one hour early (at noon). Also happening in the VIP area will be a silent auction featuring beer-themed items as well as items donated from local Oxford businesses such as RockIT Computer Solutions, Sweet Cheeks, Deal’s Auto Repair, Lafayette Carpet Cleaning and more. Online ticket sales are ending soon. There are only 100 VIP tickets available per day. Ticket prices increase by $10 at the door. There should be enough free parking, but for those who would like a ride to the event, there will be a shuttle going to/from the JCPenney parking lot ($10 fee). There will be some fun gifts/crafts for purchase at the event, so don’t forget to bring some extra pocket change with you. Check out the Oxford Beer Festival site for event information and ticket comparison. General admission is $35/pp/day and VIP admission is $75/pp/day. Find out more about the VIP chefs in the videos below. Have you been to Colonel’s Quarters at Castle Hill lately? They’ve just released a new menu filled with Southern favorites such as pimento cheese fritters, pulled pork on homemade biscuits, catfish po-boys, chicken spaghetti, meatloaf and more. Vegetable plates are also available. View the entire menu here. 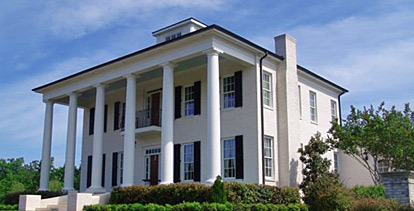 The kitchen at Colonel’s Quarters at 120 Castle Hill Drive is open from 11 a.m. until 9:00 p.m. every Sunday and also offers a full bar every Sunday, thanks to its resort status. 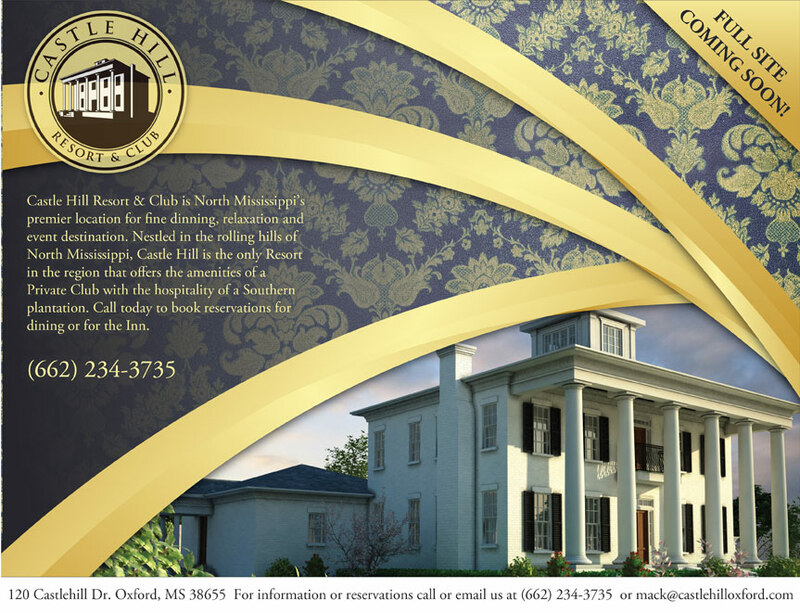 For more information visit the website or call 662-234-3735. If you haven’t been out to Colonel’s Quarters at Castle Hill lately, the restaurant recently hired Lauren Lanza, the chef from Yocona in Exile. She’s brought a new menu to Colonel’s Quarters, with items such as fried goat cheese salad, braised short rib grilled cheese, butternut squash lasagna and pan-roasted salmon. 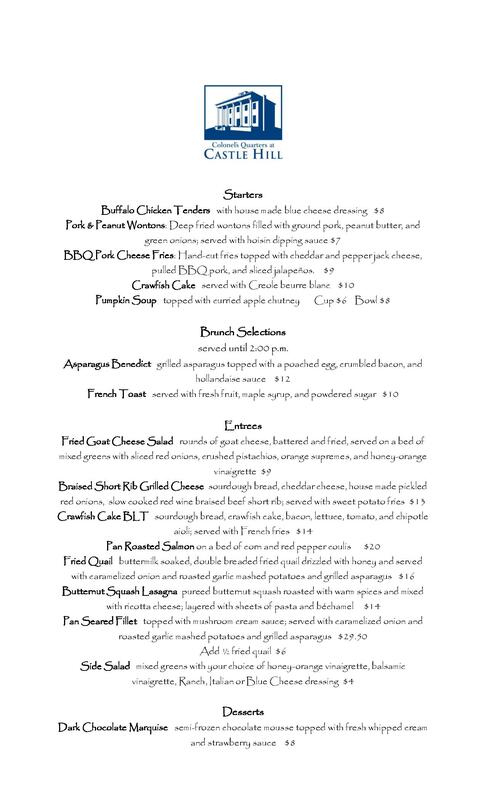 Brunch is available from 11:00 a.m. to 2:00 p.m., the kitchen is open until 9:00 p.m. and the lounge is open til midnight. Colonel’s Quarters also has resort status, so the bar is always open on Sundays. 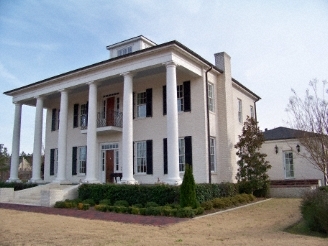 Colonel’s Quarters inside Castle Hill Resort is ready for Ole Miss football season with a full line up of bands and specially prepared menus for every Friday night before a home game, which includes September 2, September 9, September 23, October 14, October 21, November 11 and November 21. Check out all of the menus, complete with a full buffet with chef-attended carving station; pasta, shrimp and potato stations and more here. In addition, the website is now live and you can peruse the full menu (offered Wednesday through Sunday), which includes items such as potato-stuffed lobster tail, blue corn crusted scallops, house-made basil fettuccine, bone-in veal strip and more. The Sunday champagne brunch is also still available. Have you tried the menu? Share your thoughts by commenting below. Tomorrow night a live blues band and courtyard dining will help guests celebrate the grand opening of Castle Hill Resort & Club. The eye-catching mountaintop resort was recently purchased by Dr. Gary Roberson of Jackson, Mississippi. Chef Hal Rusk says he’ll be bringing Southern fare with a fine-dining twist to customers of Castle Hill’s Randolph restaurant with the introduction of dishes such as striped bass with catfish cream sauce and veal with quail eggs. The full menu will be available online soon. The restaurant and lounge will continue to be open to the public, although a new, private, social club membership is also available, which will guarantee preferred reservations and seating. Restaurant hours will be Wednesday through Saturday (starting at 6 p.m.) and a Southern-style Sunday lunch buffet will be served 11 a.m. to 2 p.m., with dinner 5 p.m. to 8 p.m.